Marco Polo Tracker is a new rf pet tracker. But some claim it's not as accurate as it could be. Find out the truth in my in depth review. Hi, I'm Karin and I'd like to welcome you to my Marco Polo Pet Monitoring Review. Are you wondering if the Marco Polo pet tracker constantly tracks your pet or you have to wait for it to update? Are you worried that the tags will come off if your dogs like a little rough housing? Are you looking for a pet tracking device that can be used anywhere rather than just in the US? Does it actually do the job of actually helping locate missing pets? Above all - is the WOW pet tracker and pet monitoring system actually worth the money? Those important questions and more are ALL answered in this in-depth Marco Polo pet tracker review. I've talked about pet trackers before (here's my blog post on my picks for the BEST pet trackers) but today I'm going to focus entirely on the Marco Polo pet tracking device to help you pick the best pet monitor today. ​The Marco Polo Tracker Has 2 Modes Of Operation - How Does It Work? ​It's Quicker & More Reliable Than GPS Systems - Is The Marco Polo Tracker System Easy To Use? ​Who Is The Marco Polo Tracker For? ​What Animal Does Marco Polo Tracker Track? ​How Is The Marco Polo Pet System Attached? ​Does The Marco Polo Tracker Withstand The Environment? ​Is Marco Polo Pet Tracker Waterproof? ​How Many Pets Does Marco Polo Pet Tracking System Track? ​Which Devices Is Marco Polo Pet Tracker Compatible With? ​Are There Any Other Costs After Purchase? ​What Is The Battery Life Of The Marco Polo Pet Tracking System? Marco Polo Pet Monitoring System Price - Is It Worth The Money? If you are shopping for an alternative to the number bestseller Tractive GPS Pet Tracker or our top pick doesn't meet your needs then there's a lot to be impressed about with this incredible dog monitoring system. So let's dig in and talk about pet monitoring, which ones are the best to buy, and which you should avoid at all costs :). Wow, there is A LOT to love about the Marco Polo tracker system. But first, I want you to know...my review is very in depth and as you read it you'll get answers to questions that you are likely to have to help you make the best pet tracking choice today. You're going to learn what pet owners love about this pet tracking device and if there are any negatives that you should be aware of. ​My review will also be filled with various screenshots and product images so that you can really visualise what your life will be like with this pet tracker. My review will also let you know who this system is for - both from your pet's point of view and yours as well -- and I'll make various other recommendations throughout which may be a better fit for you. My featured list of pros and cons will help you make the pet tracking system that is right for you and I'll also let you know where you can usually get free shipping and the cheapest price. What I LOVE about this whole pet tracker system is that you can can actually monitor up to 3 animals with this device with an incredible 4 "safety zone" areas able to be designated for every pet. ​If you want to track multiple pets then I really think this pet tracking system is worth considering. ​However, if you are looking to track smaller animals such as kittens I believe the tag will be too big and you may want to read my review about this pet tracker that is more suitable for smaller animals called Loc8tor Lite. ​NOTE: This has also been shown to be an effective drone tracking device and comes recommended as a drone finder. The Marco Polo Pet Monitoring Locating System works pretty much in the same way :). ​The system consists of a device you hold in your hand called the locator. It also consists of tags that you can easily attach to your pet's collar. ...and the tag responds with "Here I am". This back and forth happens constantly. 1. Monitoring Mode - where it checks on your pet's location constantly. 2. Tracking Mode - where it searches the surrounding area for your lost pet and when it finds it it gives an arrow with distance and direction to follow (all according to where you are). You can choose to use the monitoring mode at all times, or simply use the tracking function when you need to :). ​Keeping multiple pets safe has never been easier. This is around the clock pet monitoring with prompt alert notifications and easy tracking. IMPORTANT: The tag is quite small and compact and is suitable for use on pets 10 lbs or larger. 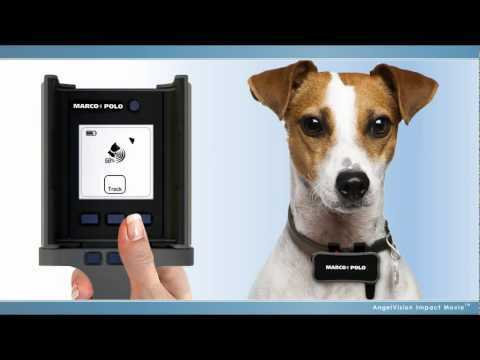 ​The 24/7 Marco Polo pet monitoring system will send a signal to the tags on your pet's collar/s. When it does this the locator will be able to deterine if your pet is within its individual safety zone. ​If the locator determines that your pet is outside the "zone" you'll receive an audible warning sound. When this happens the automatic dialer can be set up to call any mobile number you like to notify you of your pet's escape. This tracker uses one button tracking which will lead you to your wandering pet. ​It uses one button tracking which will lead you to your wandering pet. You'll be guided by directions. It also enables you to search handsfree in your car with audible sounds and when it's dark with a lit display. This Monitoring System device actually saved a beautiful dog named Pretty. Pretty lived in a hilly area and had chased a deer and gotten lost. Her owner took her tracker unit on her motorcycle and rode around the lake perimeter and then further on foot and eventually was able to see her through the heavy rush about 400 yards away. ...And the rest, as they say, is history :). When you search for your pet this will act pretty much like a personal radar system as it constantly scans the surrounding area (including backyards and also house interiors). A great feature is the fact that if your pet is actually outside range you can in fact scan 100s of acres as you continue your search. As soon as your pet becomes in range the Locator will quickly guide you to within inches of your pet's location. ​What particularly stands out is the fact that you can monitor and track up to 3 pets with this pet monitoring system. Your starter pack comes with one tag, and two more can be easily purchased. ​When one pet wanders off that pet will trigger an alarm set for their unique tag. Just press the tracking button for that pet's tags and it will start looking for its specific location. ​This is super unique. Usually at best you can set one safety zone (with some trackers you can't set any). However, now you can set four safety zones for easy use in four different locations. ​The smallest safety zone the Marco Polo tracker allows is much smaller than GPS pet trackers allow. This makes it particularly suitable for those of you in the suburbs with a small backyard. ​The biggest safety zone is ideal for rural areas where it will work with ease. ​This is a great feature. Using the Rescue Group Searching feature your pet's tag ID can actually be transferred to other Locators. It comes highly recommended if you take your animals with you hiking, camping or with you in your RV. ​Every few seconds it updates your pet's location and direction. An added benefit is that when you see the location it is always according to where you are -- not some landmark or place that you're unfamiliar with :). This is how it differs to GPS systems which update every few minutes (by that time your pet could be several 100 metres away, right). ​Setup is super simple. You can start monitoring your pets as soon as you unpack it, or with a few simple button selections you can customize it quickly for your specific requirements. Another benefit is the fact that you don't need internet or web-based setups at all :). ​How simple is this...As soon as you get an alert that your pet has wandered off all you need to do is press ONE button and just follow the onscreen arrow. ​This is a great benefit if you feel easily overwhelmed or confused. Some trackers you have to start circling a certain way and walking a certain way for them to work (some people find this quite unsettling ;). With this one, it's just one press and you're good to go (just follow the arrow). ​This makes it simple for anyone in your family to use :). ​This makes it super reliable. We've all experienced times when we lose phone coverage (usually when we need it the most). That will never happen with this pet tracking device. ​This is particularly helpful if you take your animal hiking or travel to -- or live -- in a mountainous area. ​This pet tracking system relies on "high availability" which means no battery charging for as long as possible. For everyday pet monitoring your collar tags will operate for up to 3 months. ​NOTE: If you are actively searching for your lost pet your handheld locator will last for up to 3 days. ​The device can track your pet up to 2 miles away in open conditions. However, as this is a 2-way radio system the range can vary depending on any obstructions and also the terrain. It works pretty much like a walkie-talkie. The range may be reduce if there are hills, buildings, etc. ​Due to the fact that it doesn't rely on GPS it can work anywhere. ​Not only that it will also work in remote areas. Its website states that it will work -- quite incredibly -- just as well in a mountainous area as it will at the North Pole and 1000 feet under the ground in a salt mine. It will also penetrate residential building materials with ease. It can be used with cats and dogs without problem (though it may not be suitable for smaller animals). But not only are private pet owners using this pet tracker but according to the website so are pet nanny services, dog obedience trainers and performance animal trainers. ​It can be used with cats and dogs without problem (though it may not be suitable for smaller animals). But not only are private pet owners using this pet tracker but according to the website so are pet nanny services, dog obedience trainers and performance animal trainers. ​The tag is attached to your pet's collar. ​The official website states that the locator is weatherproofed for light rain. Relating to the tag, it states it is weatherproofed for rain and shallow submersion. ​No, the locator tags are not waterproof. The manufacturer considers it to be fully weatherproof, splash resistant and can be submerged in 6 inches of water for 10 minutes at a go. ​It tracks up to 3 pets, though 2 additional tags will need to be purchased. ​NOTE: It is actually possible to have more than three homing tags, you just simply choose the three which you wish to use at various times. ​As it operates on radio frequency it doesn't actually work with smartphones or web browsers. The internet isn't even needed for it to work. ​Other than replacing the batteries, there are no additional costs as it doesn't rely on a cellular network and is not a gps tracking device. No, it is used via the handheld handset only. ​The battery life for the tag is up to 90 days. The battery life for the Locator is 180 hours when in tracking mode and up to 3 days when in searching mode. ​The tag weighs 1 3/4 ounces. It's 2 1/2 h x 1 1/4 w x 1 1/8 in diameter. The ocator weighs 10 ounces. It's 6 inches high x 3 1/2 inches wide x 1 3/4 inches in diameter. ​My research shows that this track is actually easy to use right out of the box which is a real plus. ​Another big plus is that it also comes with very good instructions. I consider this to be really important. In my research earlier today I was, in fact, going to review another pet tracking device but all I read was complaints about the lack of any kind of instructions or manual and the fact that it was very complicated to setup so I immediately scraped that pet tracking device off my list! ​The manual also contains some very helpful tracking tips that every user should read. The fact that you can track three pets and create four individual safe zones makes this tracker really stand apart from others. The tags seem to fit easily on most collars. ​NOTE: The tag is actually designed to sit under your pet's neck. You will be advised of a tag's low battery with a Low Battery message. ​It's very cost effective given that you don't have to rely on a subscription of any kind. The battery life is very reliable and significantly long. The fact that you can set the auto dial feature to place a call to nominated phone numbers to alert you is a great feature. It's been proven to work in both large, mountainous rural areas as well as inside smaller spaces and in buildings without trouble. ​This is an ideal pet tracker for use in areas that often have no service and also if you travel off road with your pet. NOTE: Some pet owners just use it for tracking purposes (if their pets live in enclosed yards) and don't use it for monitoring. Ultimately, the choice is yours :). Pet owners are also very happy with the customer service of the manufacturer. In fact, the inventor states that the manufacturer offers a 1 day turnaround for all service (depending on where you live), both in warranty and out of it. It has been suggested by a few users that the Locator unit have a wrist loop of some kind to prevent dropping. It won't track your pet's activity. It doesn't store your pet's valuable data and information. Like with everything electronic, sometimes signals will be louder and clearer than at other times. ​Some pet owners have commented on the low sound of the Locator alerts at times. However, if you have a skittish pet this can be a real benefit as they won't be alarmed by the noise. NOTE: For best tracking results, hold the Locator waist high in front of you, level to the ground, as if you were carrying a pan of water. ​This is definitely not one of the cheap pet tracking systems, however, it's important to bear in mind that you can track up to 3 pets with it which effectively reduces the cost per pet and make it an incredibly affordable option. ​Also, you can expect to save $100s over the product lifetime because you aren't required to use any subscription-based services. ​My investigation and review has taken many hours to put together. This tracking, monitoring and recovering device comes highly regarded. The reviews are overwhelmingly positive and its overall rating seems to be very high rating, with many users giving it a 5 star rating. ​It provides a lot of peace of mind and is considered to be a very reliable pet tracking system. It can be used either for monitoring and tracking, or some users have preferred to use it just for tracking when needed. It's very easy to set up and customer service is considered to be exemplary which is very important. The fact that it's run via radio frequency is very popular considering that cellular networks can be very unreliable. ​I've thoroughly enjoyed investigating this pet tracking device. It is both highly regarded and also highly reliable. I love the Marco Polo pet tracker and if you're looking for a pet tracking option that doesn't require monthly fees or a cellular network then this is the one for you :). Many users consider it to be the best pet tracking device on the market, equally for cats and dogs. Through my research I've also learnt that drone users recommend it also for locating their drones and RCs. I have not yet seen one complaint regarding the customer service of the manufacturer so that is something very important to bear in mind. You can get started with this pet tracker straight out of the box and its 1-click technology also means that it's pretty easy for anyone to start using. I very happily give it a 4.5 out of 5 star rating. ​Now to my Marco Polo Tracker Review…. ​The Marco Polo Tracker Has 2 Modes Of Operation – How Does It Work? ​It’s Quicker & More Reliable Than GPS Systems – Is The Marco Polo Tracker System Easy To Use? Marco Polo Pet Monitoring SystemPrice – Is It Worth The Money?